My area of Colorado is in the winter range of Harlan's Red-tailed Hawks and they often start migrating here in October from their very far north breeding grounds. I spotted this new arrival yesterday in Canon City and unfortunately it was pretty distant so the photos are not real sharp as I had to crop them severe and terribly back lit. 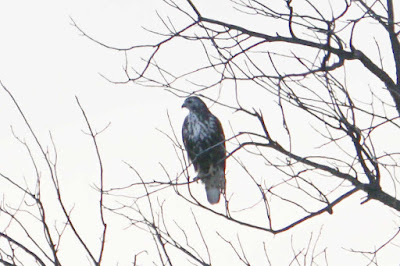 This is a dark morph hawk with whitish tail, blackish belly, streaked white chest and white on face surrounding the eye.